Micro sized transmitter, in a flexible polymer, water resistant case. Configured as 2 easily concealed components. With detachable lithium ion rechargeable battery and Lemo connector for a removable lavalier. A revolution in concealment. The two piece rubber case of the Incognito can be hidden in wigs, undergarments or in almost any costume or stage prop. A member of the QT-5100 series, the Incognito has full wireless remote control. 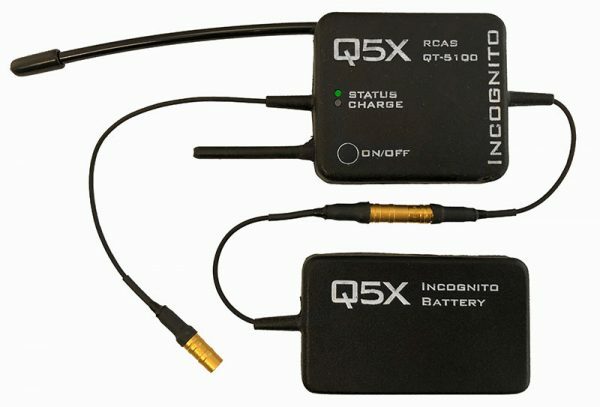 The QT-5100 Incognito utilizes the RCAS™ (Remote Control Audio System) a revolutionary way to remotely control transmitter settings from a central computer or hand held remote control. 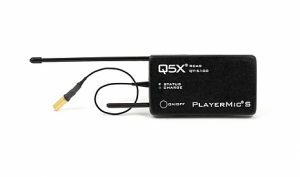 The remote functions allow technicians to control; on/off, monitor status and battery level and make on-the-fly adjustments of frequency, mic gain, RF power level, mode and grouping, all wirelessly. The QT-5100 Incognito offers approximately 3,000 channels. It is tunable from 525 to 600 MHz in 25 KHz steps. The unique two part design of the QT-5100 Incognito is based on the observation that sometimes it can be easier to hide 2 tiny components rather than 1 small one. The Incognito can be used invisibly in a bra or bikini top. For theatrical productions, it can be balanced on both sides of a wig. The external plug-in lithium ion battery pack can be changed quickly, allowing you to keep shooting for up to 14 hours @50mW depending on the battery ordered.